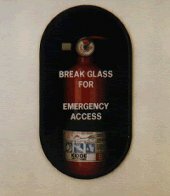 Protect your break glass station with a glass which is safer to break than normal, float glass. The type of material you choose will depend on the type of station and its location. The only material specifically designed for break glass use. It breaks into pieces that do not hold an edge and is therefore much safer to break than glass. The pieces can be safely cleared away if it is broken by accident. Used for fire alarms, oxygen shut off valves and key boxes. This is tough to break as the name suggests but when it does it forms small cubes of glass which are much safer than float glass. This is often used for oxygen shut off valves and fire extinguishers in public transport. Plastic is normally tough but can be weakened to make it break over certain areas. This is safer than toughened glass and real glass but can be awkward to weaken. This is sometimes used in key boxes but could be used for oxygen shut off valves. 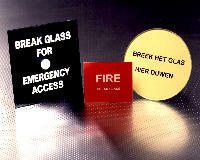 If you need break glass, please contact us to find out more information. Or you can subscribe to our E-zine to keep up to date with all the break glass news.